Stephen Pitalo – VJ, music video historian & expert on THE GOLDEN AGE OF MUSIC VIDEO (1976-1993) — can be booked to give this multimedia presentation chronicling the evolution of the music video form, from the early jazz films, movie musicals and early television performances, up through 70s experimentation and the 80s MTV heyday, concluding with the demise of hair metal & the rise of the Seattle sound in the early 90s. 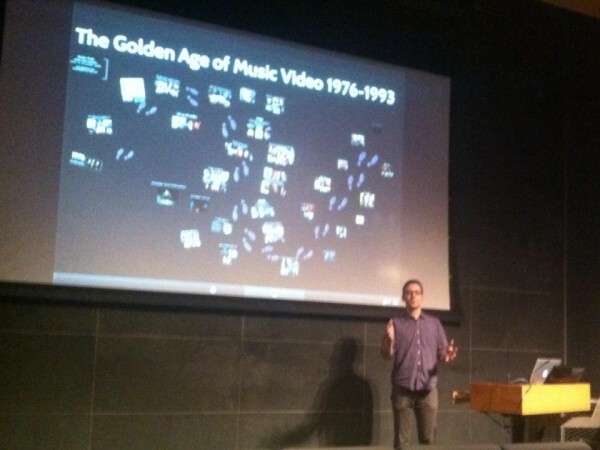 With information gathered from more than 100 interviews with music video directors and artists, Pitalo points out key events along the way, spotlighting that era called THE GOLDEN AGE OF MUSIC VIDEO, when pioneering and revolutionary filmmakers were creating the iconic music video images we still talk about today. The talk is presented on a suped-up modified Prezi platform that works the same as PowerPoint (without bringing the boring) and includes photos, graphics, audio, video and more. The talk is designed as a 2-hour presentation plus 30 minutes for Q&A. Pitalo is available to present this with just a VGA or HDMI video input and 1/8 inch audio jack connection for his MacBook Pro computer. Shoot the Singer, Cue The Horse: Adventures in the Golden Age of Music Video, Live From Memphis presents Music Video Showcase, June 17, 2012.